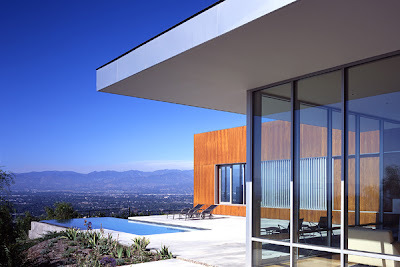 On a slightly different scale to other posts, Zoltan Pali, of Studio Pali Fekete architects (SPF:a) has created a fantastic huge residence here in Mulholland Scenic Parkway, overlooking the San Fernando Valley, California. 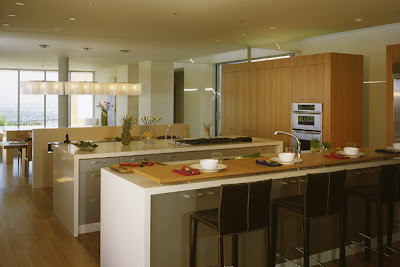 I think that the crisp clean lines of this design are what appeal. 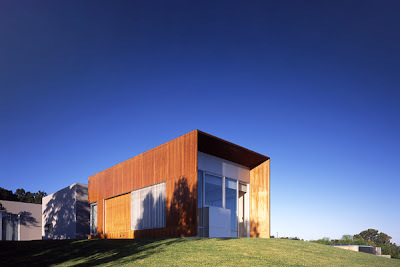 The large openings and long dimensions of this house and the other SPF:a works, fit together with Isay Weinfeld and Marcio Kogan works in my top list. It's crisp, clean and minimalist, but without feeling like a hospital or cleaned out art gallery. In other words, grand, but with cosy areas as well. 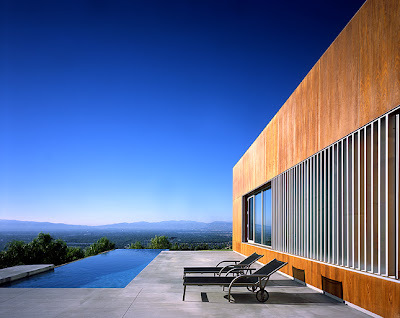 The house has a breeze corridor, separating the living and sleeping areas, and SCALE. The presence of the huge wood clad master bedroom is impressive and the views from the living room out across the pool, wow! Hidden beside this are a somewhat private swimming area leading to a cozy living room. To keep your back warm whilst you gaze out the window across the pool, the living area shares a an open fireplace with the dining room behind. Heading up a couple of steps you hit the kitchen area of this open plan wing and behind the kitchen, a wall, dividing off a more private living room. So either side of this long corridor with open ends are the living and sleeping areas. 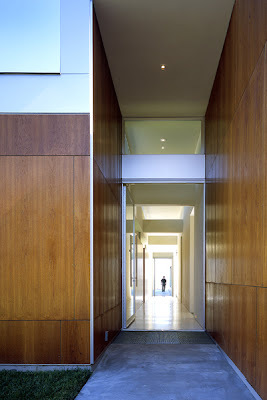 Crossing this hall at the heart of the house are courtyards connecting to the dining area that provide another passage for airflow in the hot Californian summers. They also provide a divide between the children's rooms and the master wing. 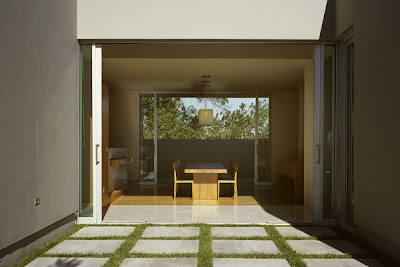 The layout shades the house to minimise the use of air-conditioning and the large opening doors let the breezes in. 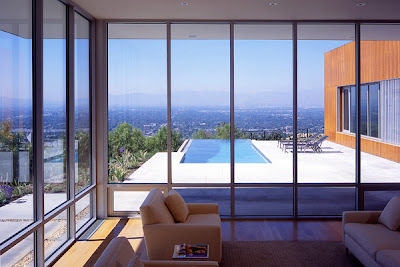 Not quite a design focused on energy efficiency (all that open glass) but it really takes in the views well and I think it's something special. Thanks for the message and support. A quick play with feedburner and here we are. Let me know if it works or if I need to modify anything.